An experienced snowmobiler, John Slemp, 52, of Damascus, Ore., miraculously survived a 1,500-foot plummet into the crater of Mt. St. Helens. He is the first person ever to fall into the crater. After dropping into the crater of Mount St. Helens, John Slemp miraculously survived with minor injuries. (ABC News) On Saturday, Slemp, his son Jared and a family friend took their snowmobiles up to the crater's rim, where John and Jared parked their vehicles, then crawled on their bellies to peer over the cornice — a dangerous overhanging shelf of snow at the crest of a mountain — into the crater itself. The cornice broke loose and Slemp dropped about 150 feet. His son began to slide down with him until their friend grabbed him and pulled him back to safety. The elder Slemp landed on a snow bank, but when he stood to climb back up the crater, the shelf of snow crumbled beneath him and he tumbled about 1,300 feet further down the crater, riding a tidal wave of avalanche debris on his hands and knees. At 5:20 p.m. PT, the sheriff's office received a phone call that a man had fallen off the crater rim but was up and moving around. "I'm not surprised," Undersheriff Dave Cox said. "There was an avalanche warning in effect and the weather conditions were such that, for that elevation, the snow was unstable. There were high temperatures, which means the snow was starting to melt ... [Slemp] just happened to be the impetus that caused that cornice to give way." The coordinator of the rescue, Chief Tom McDowell, director of North Country emergency medical service, said Slemp first made a vertical drop of about 100 to 200 feet, then hit a snow bank and tumbled until the crater leveled out. "We've always anticipated anyone falls off the crater rim is not gonna survive," McDowell said. But Slemp was wearing a heavy snowmobile suit as well as a helmet and heavy boots, and he happened to fall in an area without craggy crevices or boulders which could have killed him. "[He] picked a great place to do this," Gary Kapezynski, the training coordinator for the volcano rescue team, said. "This was one of two places at the crater which were snow covered and there were very few cliffs ... if he'd have gone off in other places, I don't think he would have made it." The two men at the top of the crater did not call rescuers themselves. Stuck there without a cell phone, they were equipped with only a family radio service walkie-talkie, which is usually only supposed to work within a range of a couple miles. According to McDowell, the walkie-talkie managed to randomly pick up the signal of a family of campers in Mossy Rock, a city about 20 miles away. "[The camper] was the one who called the sheriff's office. He maintained contact with the people left on the crater rim, and he would relay information back and forth with me," McDowell said, "'Fortuitous' would be a good word to describe this." By communicating through the camper, the rescuers knew that Slemp was fully conscious and even walking around. McDowell dispatched a helicopter with two rescuers and equipment, and as the helicopter flew over the crater, the rescuers saw Slemp standing up and waving. The helicopter descended about 1,500 feet into the crater, where the pilot performed what is called a one-skid landing — which is not actually a full landing but a tricky hover involving only a single part of the helicopter touching down. "You hover with one skid pointed in the snow with very little clearance and [the pilot] was able to do that, let Will get out and get to the patient," Kapezynski said. To pick up the rescuer and Slemp, the pilot "then [did] the same thing to go back in." Slemp was pretty banged up but he was healthy enough to scramble down and get into the helicopter. His leg was splinted and the rescuers checked him out as the helicopter flew back. The rescue effort was swift and wrapped up in 2.5 hours, by about 7:30 p.m. PT. Cox said that injuries on Mt. St. Helens are fairly common. "We have injuries on the mountain just about yearly from people trying to climb ... you get people who are 'day hikers' who think it's just a stroll up to the crater rim, but it's still a fairly technical mountain to climb." As Slemp left the crater in the rescue helicopter, his son and friend left the crater rim to return home in the car they drove in. Slemp appeared to have one more thing on his mind, and he made a request of his rescuers. "Did you tell those guys that the car keys are in the snowmobile, parked at the top of Mt. St. Helens?" he asked. Slemp was taken to Yacolt, Wash., for medical care, and transferred to Legacy Emanuel Hospital in Portland, Ore. The hospital did not return calls inquiring about Slemp's condition, but Slemp's brother-in-law Randy Fairley told ABC News that, to his knowledge, Slemp was recovering. 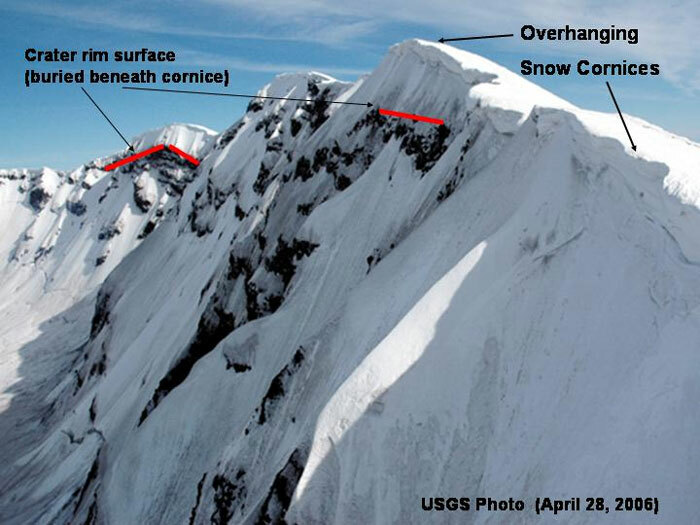 Cornices are unstable and prone to sudden failure. Extreme caution is advised! Do not approach the crater rim unless you can find a wind-scoured area where the surface of the rim is visible. The crater rim is unstable and is subject to frequent rockfall and collapse. Stay back from the crater edge, it is potentially hazardous at any time of year (especially during the period of elevated avalanche danger and rockfall during the spring thaw). by Dennis Lapcewich taken on Friday, July 27, 2007 at approximately 2:02 pm PDT. Shaken by an earthquake measuring 5.1 on the Richter scale, the north face of this tall symmetrical mountain collapsed in a massive rock debris avalanche. Nearly 230 square miles of forest was blown down or buried beneath volcanic deposits. At the same time a mushroom-shaped column of ash rose thousands of feet skyward and drifted downwind, turning day into night as dark, gray ash fell over eastern Washington and beyond. The eruption lasted 9 hours, but Mount St. Helens and the surrounding landscape were dramatically changed within moments. Fall / Winter Climbing Access: Snowfall and wind will form unstable cornices (snow overhangs) on the crater rim (please see our climbing page and scroll down to cornice photo). The crater rim is unstable and can be hazardous at any time. Forest Road 81-830 to Climber's Bivouac is closed by snow at Cougar Snopark. Forest Road 83 (access to Lava Canyon) is closed by snow at Marble Mountain Snopark. Permits are required above 4800 foot elevation on the volcano year round. During the Nov 1 to March 31 winter climbing season permits are available at no charge by self-registration at the Climber's Register or at Marble Mountain Snopark. The Climber's Register is located at the Lone Fir Resort, 16806 Lewis River Road, Cougar, WA. (360) 238-5210. 2009 Climbing Permit Sales will begin at 9:00 a.m. PST on February 1, 2009: Permits for the April 1 October 31 climbing fee season are sold online, in-advance on a first-come, first-served basis through the Mount St. Helens Institute. The Forest Service has banned snowmobiles on a section of the south side of Mount St. Helens most popular with climbers and backcountry skiers. 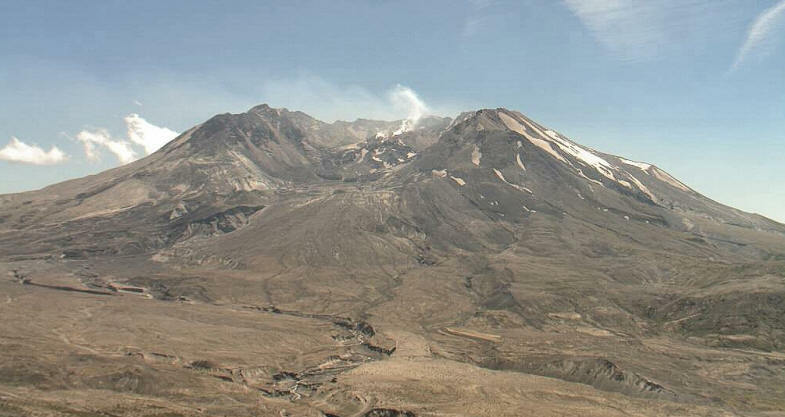 A spokesman for the Mount St. Helens National Monument, Peter Frenzen, says some had complained about noise. Gifford Pinchot National Forest officials also were concerned about snowmobile safety on the steep slope. Snowmobiles are still allowed on other parts of the volcano. The Longview Daily News reports that climbers, skiers and snowmobilers need a permit to travel above the 4,000-foot level of the mountain.